Click on any of the images below to view a video of Katherine's work. If you have difficulty viewing a video, please visit Katherine's YouTube channel, where they are all available. Volkswagen Game Day 2013 Commercial: Get In. Get Happy. 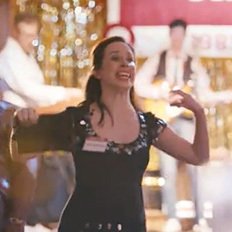 In January of 2013, Katherine went to L.A. to film this 2013 Volkswagen Super Bowl ad directed by Tom Kuntz (commercial veteran whose other work includes Old Spice and DirecTV). She was thrilled by the rare and prestigious opportunity to be in a Super Bowl commercial and had to add it to her bucket list, just so she could cross it off. The commercial was released to much fanfare on CNN's Starting Point. It was also featured on ABC's Good Morning America, NBC's Today, NPR’s All Things Considered, ABC's The View, and in USA Today, The Washington Post, Ad Age, and the UK's Daily Mail, among other media. 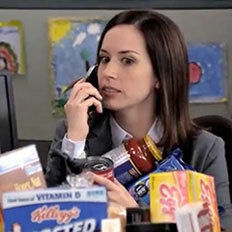 David Hinckley of the New York Daily News rated it one of the five best Super Bowl ads of 2013. It also garnered more than 14 million views on YouTube. 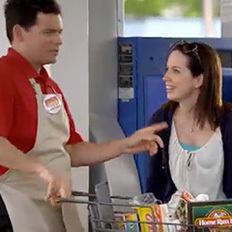 In 2012, Katherine was featured in multiple commercials and radio spots for Jewel-Osco's "Gotta Love Lower Prices" campaign. Each of these spots featured Katherine as "Helen," a busy mother being chased down by "Bob," a zealous Jewel grocer itching to tell her about the latest deals at Jewel. In December 2012, Katherine filmed several spots for the Las Vegas Convention and Visitors Authority's latest promotional campaign. The same fine folks who created the "What Happens in Vegas…" campaign created "Las Vegasdotcom, The Man." 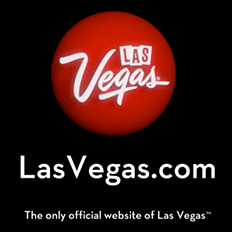 These commercials feature an average guy named Las Vegasdotcom, whose small town life is upended when the popularity of the website by the same name causes great confusion. The commercials were directed by the brilliant and kind Bob Balaban (Waiting For Guffman, Seinfeld). 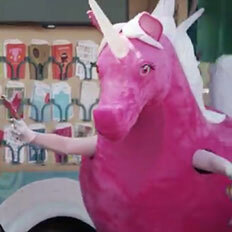 In the summer of 2012, Katherine was cast both as a salad-loving mom and a ... dancing pink unicorn. On the Perkins set, Katherine enjoyed hanging out with two sweet kids and eating strawberry salad, but found it odd there was a spit bucket on set. Who doesn't like strawberries? The ads for justWink (a new, hip card line from American Greetings) were filmed at Summerfest in Milwaukee, where it reached 98°. Katherine's unicorn costume was assembled by the costume makers for Disney On Ice. 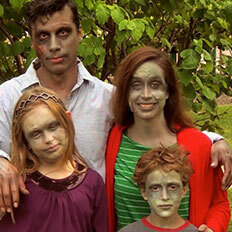 These commercials feature Katherine as a zombie mom who had recently moved with her zombie husband and zombie children to the Village of Homewood, Illinois. 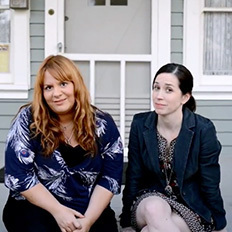 The intention of the three pieces is to show all of Chicagoland "the fun, creative, and quirky mindset of Homewood," and everything was filmed on location in the south-side suburb. In addition to becoming a YouTube hit, the campaign won a City-County Communications and Marketing Association (3CMA) 2013 Savvy Award for "best social media communication & marketing tools". The videos played at last year's Homewood's annual Fall Fest, and Katherine and her husband were in attendance. 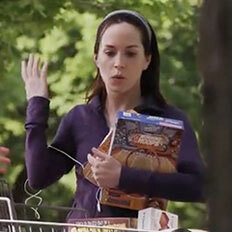 In this scrabble-themed indie film, Katherine plays Holly, a "word nerd" who befriends the film's protagonist, Zoe. 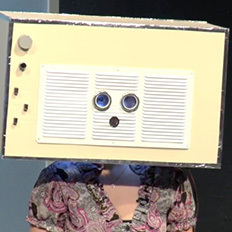 As QWERTY's mismatched lovers struggle with social acceptance, Holly keeps things lively with feisty one-liners and fervid pep talks. 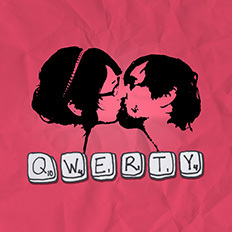 QWERTY won several "Best Picture" awards at independent film festivals around the country. Get it via iTunes. 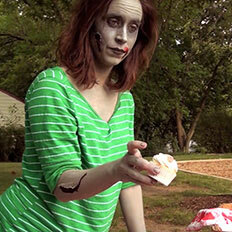 Katherine has recently been featured in two webisodes from The Onion. In "Ladies, Freeze Your Hot Young Face For Later!" (from the Dr. Good web series), she plays Laura, an ambitious, young professional who wants to make sure that her face is "still hot when [she's] ready to show it off to a potential husband in ten years." Then, earlier this year, Katherine filmed "Open Relationship Gives Couple Freedom To Emotionally Drain Other People From Time To Time," another experience allowing her to get silly and satirical.